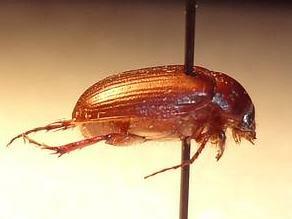 These are small, but robust beetles, usually a light to dark brown. Many species have oily, iridescent sheen. Adults eat leaves of deciduous trees. Mostly: Mar-Aug, based on data from BugGuide. Larvae prune roots of assorted plants near ground surface.